Do you know what today is, dear reader? It's January 24th! And while that may seem like a random and arbitrary date, I can assure you that it is never the less momentous. ...To start a blog that offered advice and inspiration to aspiring game masters and players. That's right! Ed The Bard is now officially a whole-year-old! And what a year it has been! So much has happened that it is almost impossible to summarize it all. But you know what? Summarizing impossible things is what I do. So let's take a self-aggrandizing look at the past year, and how it has shaped the Bard as you know him (me) today. It began simply enough, with a basic laying-out of my gaming credentials. That being accomplished, I set forth on a tirade of advice, breakdowns, reviews, and musings. In total, over the past year, I have written 102 articles, totaling 169,307 words, which have been viewed no fewer than 282,238 times. The facebook page has grown from about a dozen likes to an impressive (to me) 1,377 likes. I've tweeted 474 times, tumbled I don't know how many times, and delivered a stirring rendition of "Row, Row, Row Your Boat". I've crammed myself into a car with three other men and driven from Maine to Indiana (straight, mind you) to attend my first Gen Con. I've hosted my first Game Master Workshop at SnowCon. 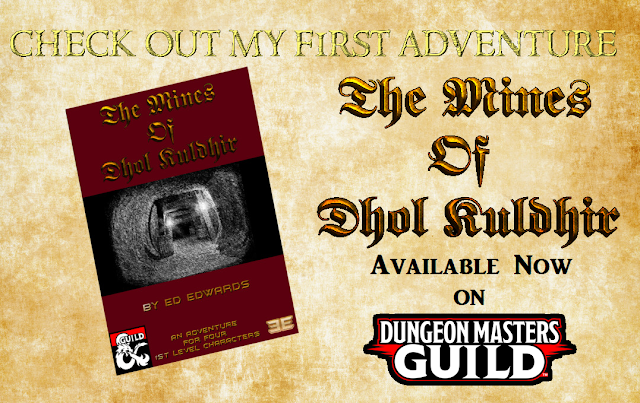 I've even published my first module over on the DM's Guild. It has been an eventful year, and I am proud of a lot of it. But the thing that I am most proud of, the thing that brings me endless joy and makes this endeavor totally worth it... is you. All of you. I cannot tell you how many people will shoot me a message or an email thanking me for giving them an idea or helping them move forward after a creative block, or (my favorite) telling me that something I said made them want to start Game Mastering or playing. You guys have made this whole thing into something bigger than I could have ever hoped for, and you guys continue to. I am eternally thankful for all of you and all that you have done to build The Bard up. This year promises to be bigger than last! More publications, new projects, more articles, more videos, and perhaps some other media should everything work out as planned (wink, wink). So, Happy First Birthday to us, you folks are the best present a Bard can ask for. My lawyer has informed me not to make lewd comments regarding unwrapping you all out of fear of inciting a class action sexual harassment lawsuit. Roll well, my friends. Here is to another year!